The Trinitarian Bible Society’s, “Windsor Text Bible” in Black Calfskin, is the New Quintessential Compact Text Bible for King James Fans. 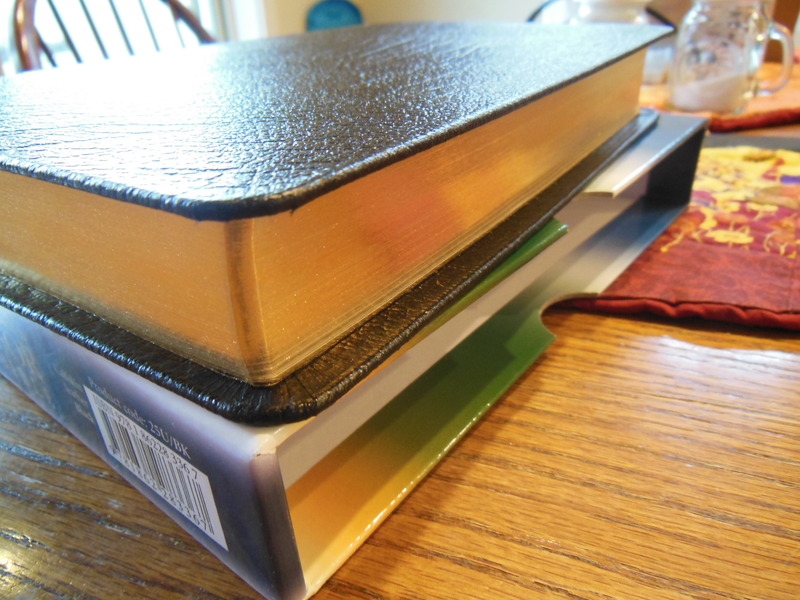 I have done some reviews on TBS Bibles in the past. They have all been very well built, and beautifully printed workhorses. I wouldn’t call them luxury Bibles like R.L. Allans, or Schuylers. Nor do they carry the extravagant expense of those Bibles. Some people feel convicted to not spend that amount of money on a Bible. They would rather put the money to better use. Of course these devout and practical people wouldn’t waste money on a shoddily manufactured product of suspect quality and durability either. Now, why throw away money on something that will fall apart? Why print the word of God on the cheapest materials, in the lowest of fashion? So, being the devout and practical people they are, they opt for a TBS Bible. I was curious about the history of this edition. The quality, legibility, portability, and price inspired me to ask questions. So I e-mailed my contact with TBS with my questions about this edition. She forwarded them to another person who had the answers. This is a direct quote from her reply, “The Windsor was first published in September 2007. It was designed to be a replacement for the Emerald Bible: the print image of the Emerald was becoming rather problematic – a common problem with reprinting older Bibles. But rather than simply reproducing the Emerald, we wanted to have a clear, sharp, more modern font, one that would last through years to come. The Windsor is now often used by churches as a pew Bible (as was the Emerald).” I was very pleased to receive this information to include in my review. 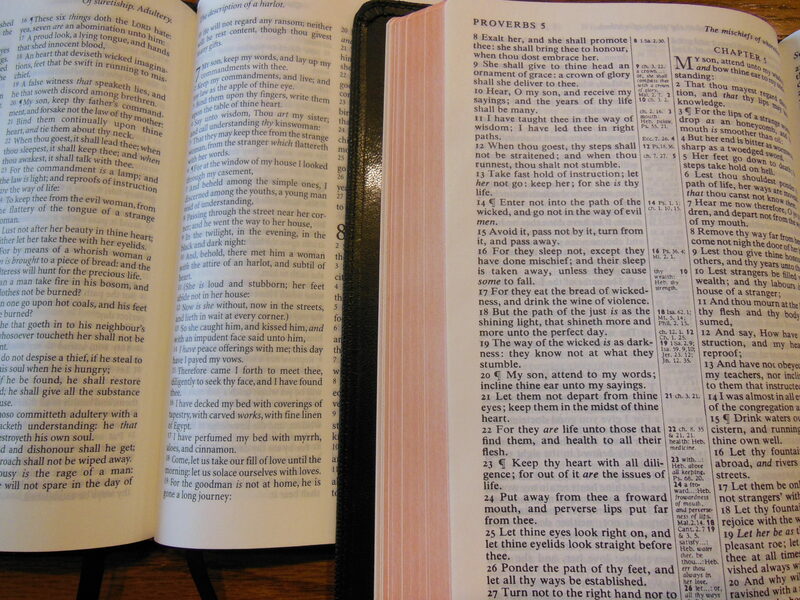 As some of you who collect Bibles know, there are several Bibles that are printed from an old typeset. The old typesets were done before modern digital printing, back when typesetting was done manually. The methods used didn’t produce the quality we are able to get today with digital font and modern precision printing. Here is an example of both. From steadfast practicality TBS produced a modern typeset of the 1611 AV KJV, printed it on high quality paper, bound it in a fine sewn binding, covered it in durable calfskin, and priced it for the common man. The size and construction of this edition makes it tactilely comfortable to hold. I found that I wanted to carry this Bible around with me. I wasn’t afraid of scratching, tearing, dropping, spindling, or mutilating it. It begs to tag along with you, and it can handle it without being babied. The Windsor arrived gratis for the purpose of review. 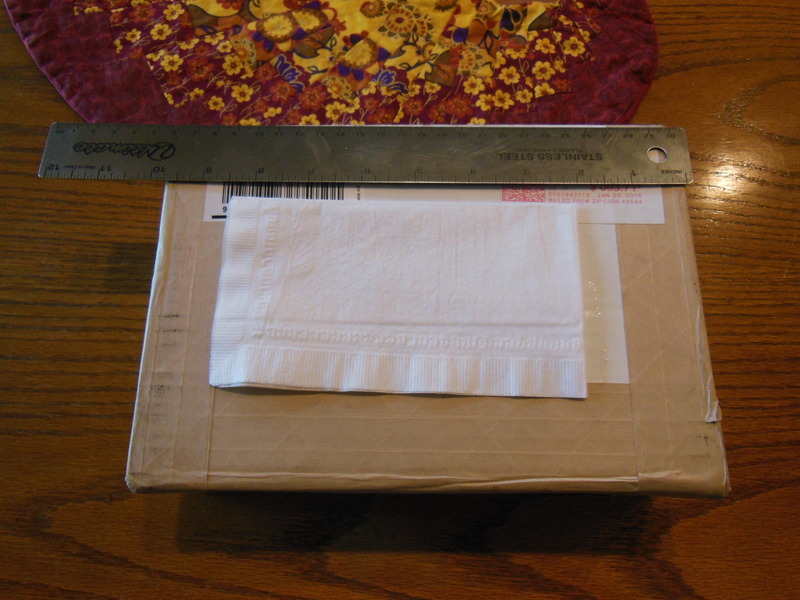 It was very well packaged, and protected for shipping. 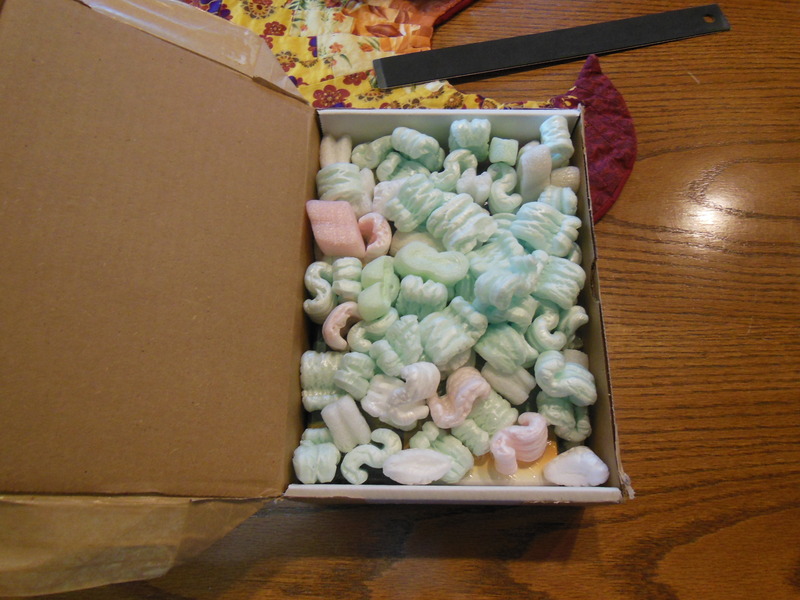 It was in a cardboard box with packing peanuts, and cushioning. 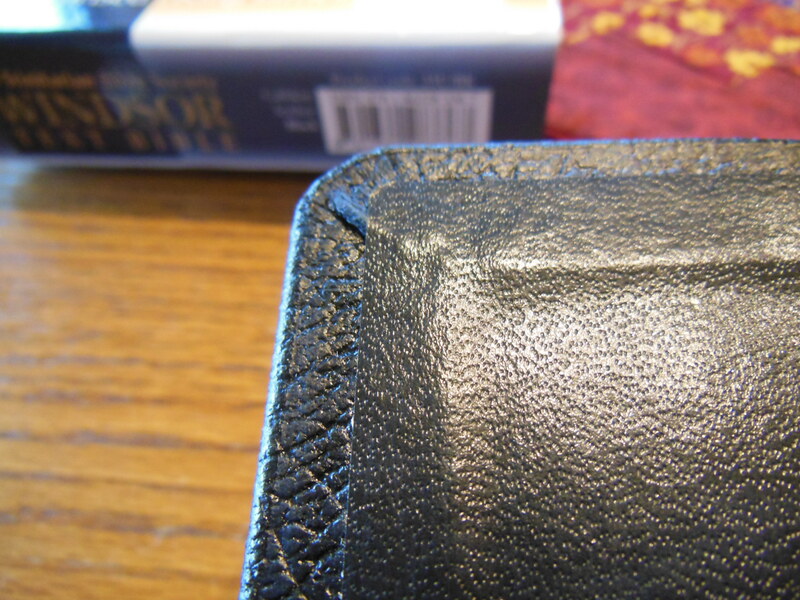 I appreciate this attention to detail, in the packaging of the Bible, to ensure that it arrives undamaged. Many publishers, even higher end ones, don’t give this kind of protection to God’s word. 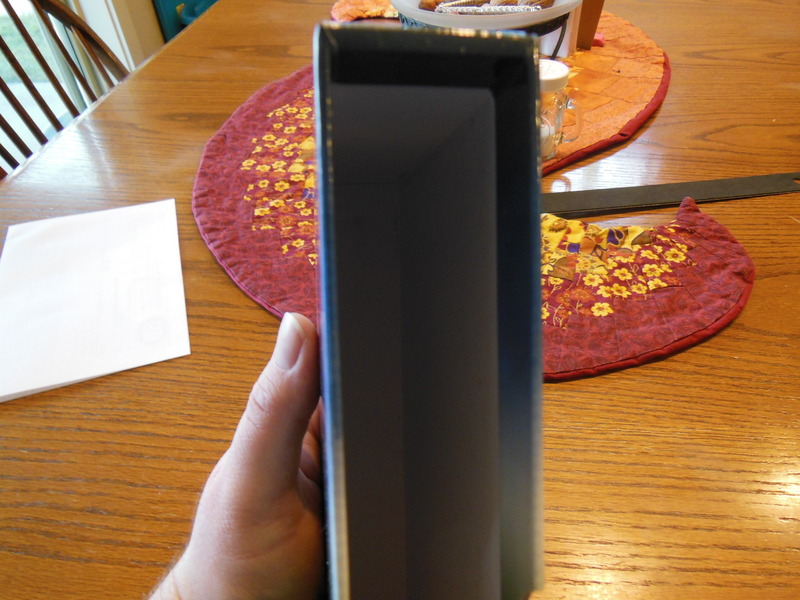 The Bible comes in a slipcase as retail packaging. 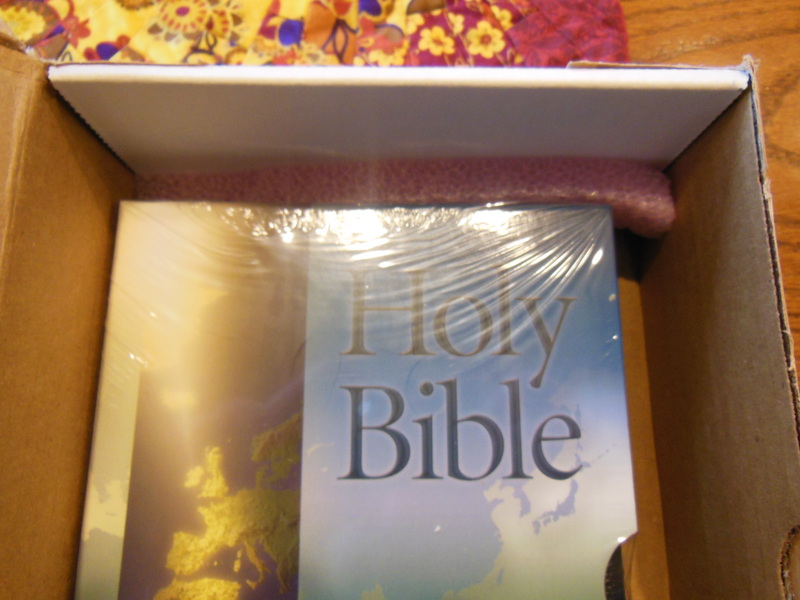 Retain it for storing your Bible, if you order one of these. The calfskin is a bit shiny, and hard. It is more so, than the Cambridge calfsplit leather, but not near as hard, or shiny as a pigskin leather cover. The spine is hot stamped in gold with, “Holy Bible” at the top and the TBS logo at the bottom. 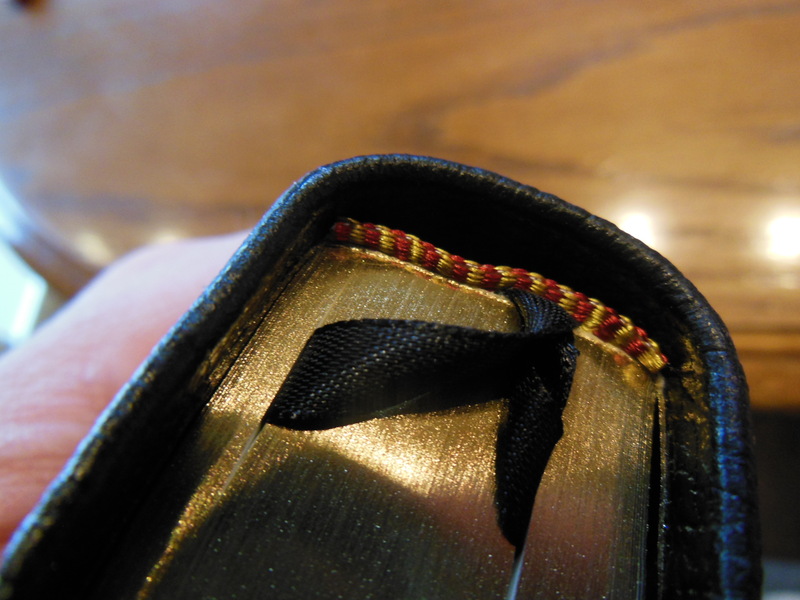 There are decorative head and tail bands and gold gilt page edges. 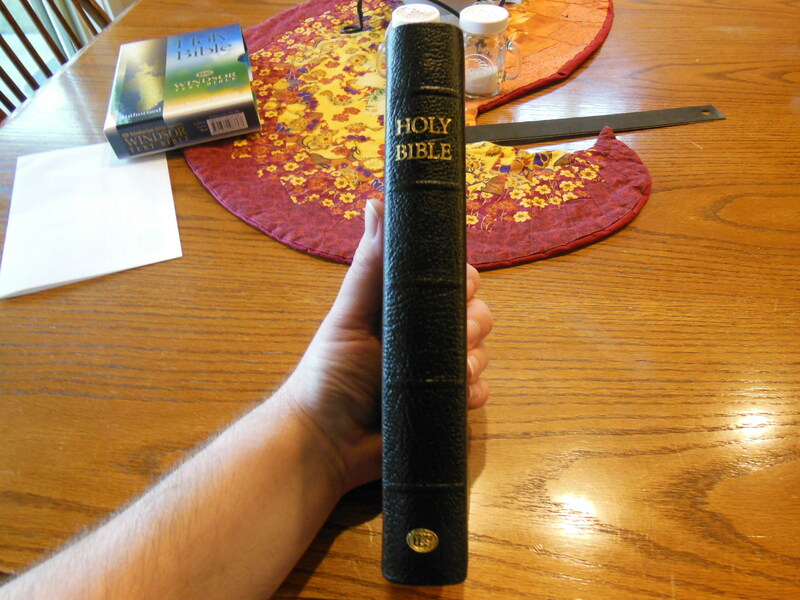 Upon opening the Bible, you’ll notice that the inner cover is lined with a black vinyl material. The corners are done quite well. The text block binding is smyth sewn and is case bound. There is a presentation page, and a publication page which shows that this Bible was printed and bound by Jongbloed in the Netherlands. 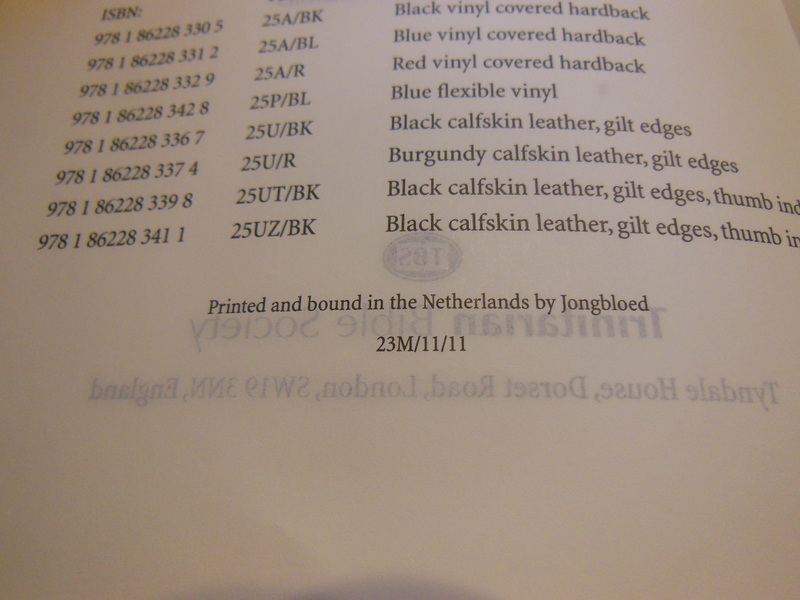 Jongbloed is one of, if not the best print houses in the world when it comes to Bibles. You also have, Translators to the Reader, and The Epistle Dedicatory. 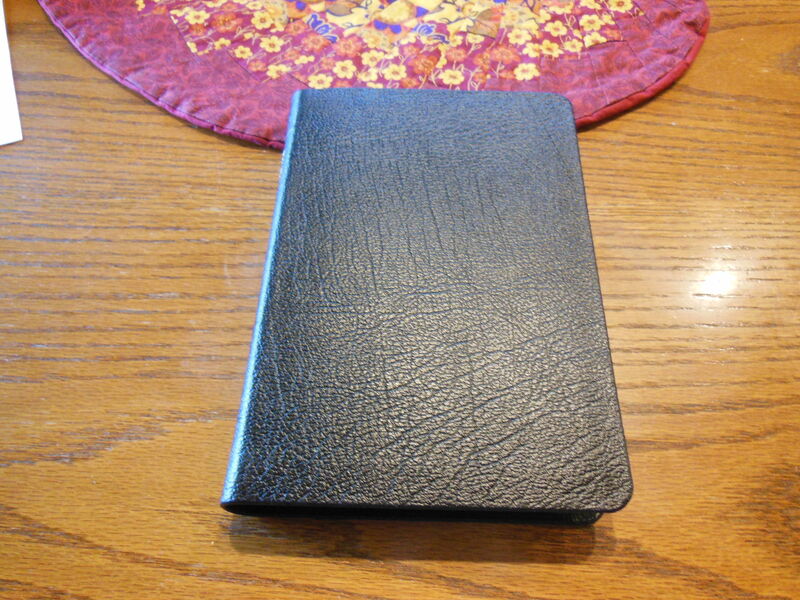 This TBS Bible should be the archetype for all compact text Bibles. It is easy to read. The font is 9.6 pt. in size. There are not any cross references to take up space. The font is printed clearly, and in sharp contrast, on opaque Bible paper. Ample line spacing adds to the legibility as well. This is a black text edition. The text is in a double column, verse format. There is little room in the margins for notes. However, there is some room at the bottom of each page for limited note taking. Chapter numbers are printed larger, and bold. Page numbers are on the bottom corners. There are two black, ribbon markers for keeping your places in the Old and New Testament during your daily reading. In my opinion a minimum of two ribbons is a necessity for all Bibles. At the end there is a, List of pronunciation of words and proper names, Bible word list and a Daily Bible reading plan. With all the quality, features, and price of this Bible you can’t go wrong. 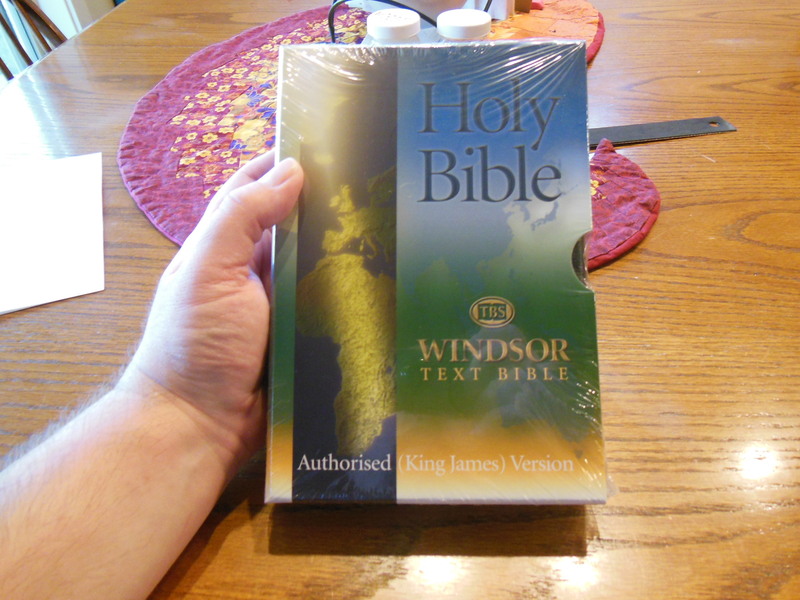 The Windsor Text Bible from TBS will set the standard for years to come. If your spouse, or children agree with you all of the time, and that is why you love them, then you don’t love them. You love your beliefs. Historic Church Documents at Reformed.org Sinners in the Hands of an Angry God.